The scent of a “piarsolade” entices me even though I usually do not drink wine. 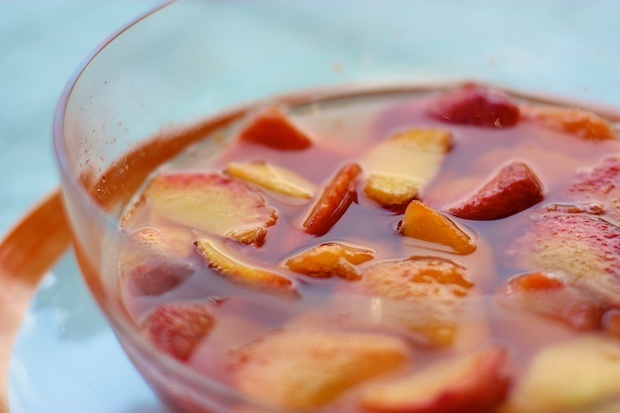 This cold peach soup can be made with a white wine or red one. If you use a red wine this soup has the final taste of something like sangria. This is a preparation which shows us that with a few ancient seasonal ingredients you can make something tasty and provide “a moment of happiness.” This soup can easily replace dessert on a hot summer day. Peel the peaches and cut them into pieces. Pour into a glass bowl, add a few drops of lemon and sugar. Stir and add the white wine. Stir again, cover with foil and place in refrigerator for at least an hour. It is ideal is to prepare this soup in the morning and enjoy it in the afternoon or after dinner. Serve in individual glass bowls. Posted in Dessert, Recipes, Soups. RSS 2.0 feed.